Posted 3/7/2010 7:06pm by Catskill Merino. Aaron & Tom shear lambs on the third day of shearing. For a week, Dominique and I had been getting the barn and sheep ready for shearing, but Wednesday into Thursday it snowed over 2 feet. The sheep were outside in the storm; Friday night we put all 205 ewes into the barn to dry off, feeding them inside with more snow forecast. But come Monday they were still too wet to shear—what to do—fortunately, the weatherman got it wrong: it had not snowed over the weekend; it had been partly sunny and windy. Because of the wind, the rams, who were outside, were drier than the ewes inside. We could shear them if we skirted off the damp parts of their fleeces; but the rams were in the lower yards, a 1/4 mile away. 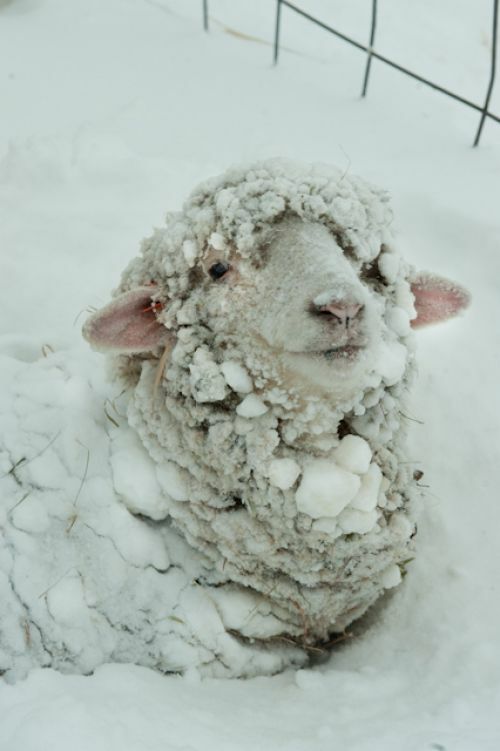 Sheep do not move well in snow deeper than their legs are long. With Poem we slowly trailed them up to the shearing barn in ruts I'd made in the snow with the tractor. When I told Aaron that he'd have to begin with the rams, he good-naturedly groaned. Shearers don't like shearing rams, especially to start, as they are big (usually outweighing the shearer) and are sometimes uncooperative. Getting a late start due to the sheep shuffle, Aaron sheared 49 big rams on day 1 and 120 ewes, who were now dry, on day 2. Tom came in from Towanda on day 3 to help him finish the ewes and to shear the remaining 145 lambs. The usual & good roustabouts were there: Chris & Dominique skirted the fleeces; this year Ryan and Jeremy, a stout young lad from the nearby Bruderhof community, manhandled the sheep to the shearers and kept the shearing boards clean. If you need a good sheep shearer, see my Links page to contact Aaron Loux. Shearing is a team effort; this was a job well done, thanks to all. We sheared 398 sheep on March 1, 2 & 3. Posted 3/25/2008 3:52pm by Catskill Merino. Shearing is a campaign of crossed fingers and logistics that begins long before the day the wool is sheared from the sheep. 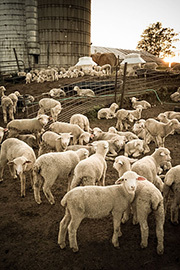 Shearers get busy in the spring; everybody wants their sheep sheared then. In mid-January I called Tom, who has been shearing my sheep for the last 10 years, to reserve a day for him to come to the farm. We agreed on Tuesday, March 18th. By then the cold days of winter will have come and gone. The sheep have been kept warm by their fleece that has grown to 3" in length in the 12 months between shearings and now weighs about 10 lb. Also we must shear before lambing in April because it will be easier for newborn lambs to find the teats of shorn ewes. The sheep cannot be sheared when wet, their wool would mildew in the storage bags. We never know if it will rain on the day of shearing until then. Last year we sheared outside, but shearing day came in a rainy week. Luckily I was able to reschedule Tom for a sunny day the following week; and as importanly, I managed to reschedule the shearing crew who handle the sheep and wool on shearing day. A good, experienced crew makes the day go well for sheep and wool: Mark gets the sheep to the shearing board; Dominique picks up the shorn fleece from the shearing board and skirts it (removes the soiled wool) with Chris who stuffs the skirted fleece into a wool bag and sweeps the shearing board between sheep. This year we will shear in a barn; rain should not be a factor. The flock is 100 sheep larger counting the lambs born last spring; Tom will bring his son Mike to shear too. Mark, Dominique and Chris will be back again and Ryan will drive up from the city to help out. Things look good.